Image quality test results from the Canon EOS R have been added to the Canon EF 24-105mm f/4L IS II USM Lens Review. Canon EF 24-105mm f/4L IS II USM Lens compared to Canon RF 24-105mm F4 L IS USM Lens. You'll likely have an opinion by 105mm f/4. Don't forget to share with friends. 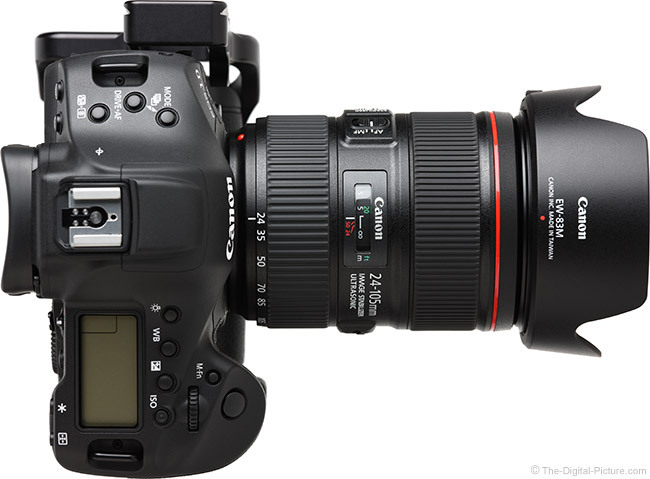 Rent the Canon EF 24-105mm f/4L IS II USM Lens from Lensrentals. Rent the Canon RF 24-105mm F4 L IS USM Lens from Lensrentals. Canon EF 600mm f/4L IS III USM Lens In Stock! The Canon EF 600mm f/4L IS III USM Lens is in stock at Canon USA-authorized BuyDig (Beach Camera). Act fast if you want this lens - this is the first time we have seen it in stock and very limited quantities are available. Get this awesome lens at BuyDig, Beach Camera, Amazon, or eBay. Permalink: Canon EF 600mm f/4L IS III USM Lens In Stock! 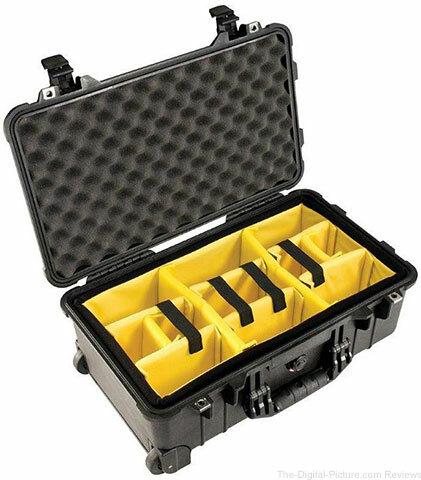 Adorama has the Pelican 1510 Camera Case with Dividers available for $159.95 with free expedited shipping. Compare at $219.95 without monopod. The Profoto Connect trigger's press release hit our email inbox early yesterday, but after looking into the product, I wasn't quite sure what to make of it. Being keenly interested in lighting and lighting gear, a button-free trigger that required your smartphone to manually adjust your flash's power levels seemed a bit ridiculous. Profoto is an industry standard for a reason. They have a knack for developing highly reliable, extremely useful lighting solutions. But I can't help but think this product misses its mark. Who wants to be constantly pulling out their phone during a photo shoot? I know I don't. So whom exactly is this product for? The video above provides some clues. Profoto believes that those who have so far been intimidated by off-camera lighting may appreciate a simple, no-fuss sort of trigger. 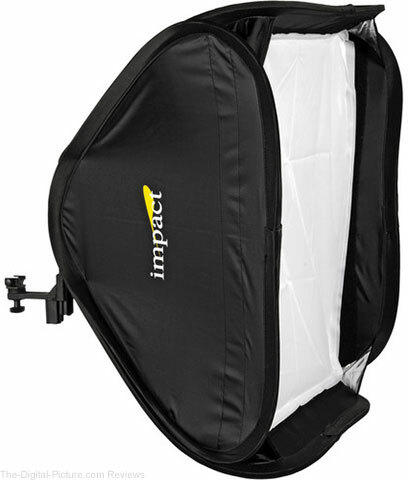 But would somone who is tepid about trying off-camera lighting lay down nearly $1,000.00 for a Profoto A1 and then another $300.00 for the Connect trigger? And from a practical standpoint, if you're going to handhold your flash like the photographer in the video, why not simply use your camera brand's flash and an inexpensive TTL Flash Cord to trigger it? I think this product could have been so much better. Imagine if it had featured a touch sensitive scroll wheel around the top of the device with a small display in the middle. With something like that, a user could easily change power levels of individual flashes (maybe a double finger tap would allow you to cycle among them?) using the display as a reference, all while maintaining the hook of a "button free" trigger. But then, the Connect would basically be a redesigned Air Remote, so Profoto would have to limit its functionality in some way for differentiation (shorter range, fewer channels, etc.). MELVILLE, NY, March 28, 2019 – Instant gratification – it’s what we crave – so take your pick from the more than one trillion photos taken in 20171 and print and stick ‘em! Canon U.S.A., Inc., a leader in digital imaging solutions, is excited to announce the next generation within the IVY product lineup, the IVY CLIQ+ Instant Camera Printer + App connectivity and IVY CLIQ Instant Camera Printer. The new IVY products are lifestyle products for the everyday photographer who wants to snap and print stick-able memories – in an instant. Don’t fret – there is no shame in your picture snapping-and-printing game. Boasting an eight-megapixel2 camera, the CLIQ+ Instant Camera Printer + App connects via Bluetooth4 to the Canon Mini Print app3, which features a variety of photo design options such as filters, photo frames and text to provide a multitude of opportunities to create fierce photos. Through the app, users can also customize their experience by recording their own on/off and shutter sounds. Users can even set up remote shooting for the ever impressive group photo. Adding a pop of color to everyday life, the CLIQ+ is available in colors such as Pearl White, Sapphire Blue, and Ruby Red and includes fresh features such as 2x2 and 2x3 printing options. Don’t forget – momma said, “sharing is caring” and with the CLIQ+’s reprint option, users can print one photo for themselves and one for a friend. For further shooting flexibility a Micro SD card slot is available along with a selfie mirror surrounded by a glowing light ring of either four or eight LEDs, providing the right amount of glow-up to make the user’s photo pop. ‘Cliq’ and print: it’s an easy two-step process with the new five-megapixel2, automatic-flash IVY CLIQ Instant Camera Printer, which is available in colors such as Bumblebee Yellow, Seaside Blue and Lady Bug Red. This new instant camera can print 2x2 or 2x3 stickers and when the ideal moment presents itself, the selfie mirror helps ensure the insta-worthy snap is perfectly positioned. The CLIQ also has a Micro SD slot, allowing users to upload photos to their laptop or PC for future projects. 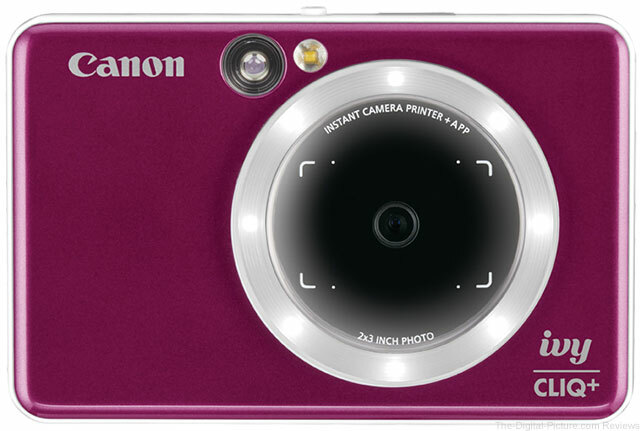 The Canon IVY CLIQ+ Instant Camera Printer + App and Canon IVY CLIQ Instant Camera Printer are scheduled to be available for in-store purchase in April 2019 at an estimated retail price of $159.99* and $99.99* respectively, and each camera/printer includes a starter pack of 10 sheets of 2x3 photo paper. 2 Image processing may cause a decrease in the number of pixels. 3 Requires mobile device to be connected to the Canon IVY Cliq+ Instant Camera Printer + App via Bluetooth and the Canon Mini Print App, available for free on the App Store and at Google Play. To access, download and/or use the Canon Mini Print App and related services, you must be located in the United States and be at least the age of majority in your jurisdiction; additional terms and conditions apply, see Canon Mini Print App End User License Agreement for full details. The Canon Mini Print App is compatible with mobile devices running iOS 9.0 or later, and Android devices running Android 4.4 or later. 4 Compatible with select smartphone and tablet devices (Android version 5.0 or later and the following iOS devices: iPhone 4s or later, iPad 3rd gen. or later, iPod Touch 5th gen. or later) equipped with Bluetooth version 4.0 or later and the Canon Mini Print App. This application is not guaranteed to operate on all listed devices, even if minimum requirements are met. 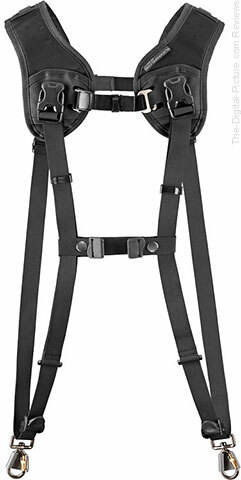 Through this weekend, B&H has the BlackRapid Double Breathe Camera Harness available for $79.95 with free shipping. Regularly $134.95. Through the end of today, coupon code FRIEND15 will save you 15% on refubished gear at the Canon USA Store. Save on refurbished cameras, lenses and speedlite flashes. Expect like-new gear with an as-new warranty. Jump on an attractive deal before it's too late! 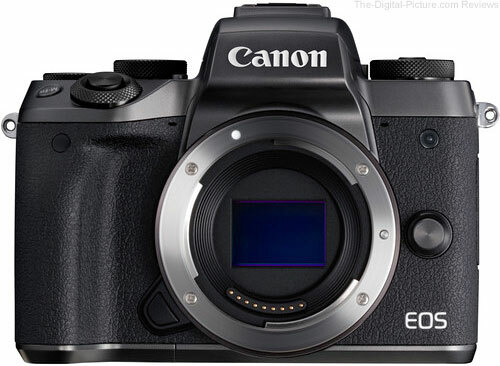 Canon is currently developing Firmware Version 1.2.0, which is expected to be available in the middle of April 2019. 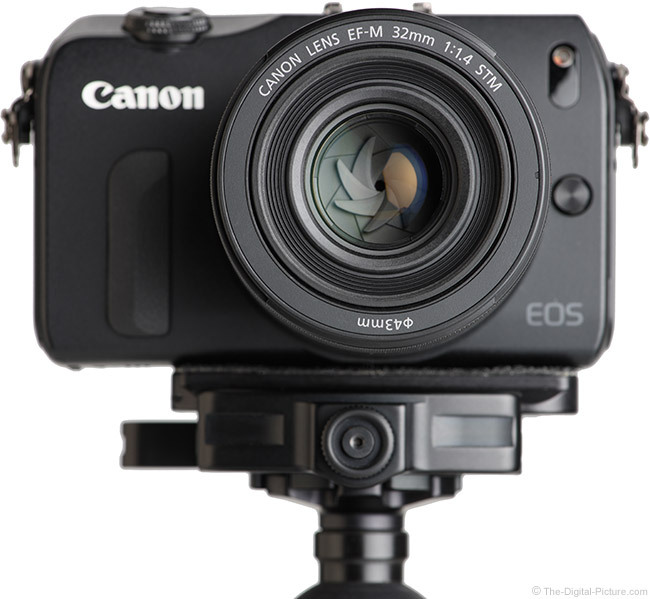 Firmware Version 1.2.0 is for cameras with firmware up to Version 1.1.0. If the camera's firmware is already Version 1.2.0, it is not necessary to update the firmware. If you have not already done so, please register the EOS R. By registering, we will be able to notify you via email about future announcements. Now available when shooting movies regardless of "Movie Servo AF" setting. Under certain conditions the electronic level displayed in the electronic viewfinder did not display properly. Under certain conditions updating the firmware for the wireless file transmitter WFT-E7 was not possible. Hot Deals: Adorama has a great selection of Refurbished Tamron Lenses on sale for a limited time. If you've been eyeing a Tamron lens lately, this is your chance to save big on your new lens acquisition. 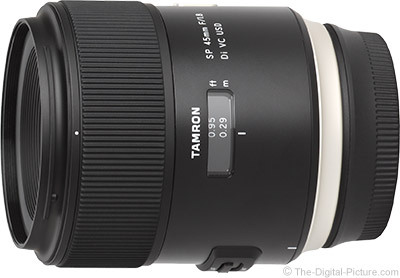 Be sure to check out the unbelievably low price of the Refurbished Tamron SP 45mm f/1.8 Di VC USD. * Price may vary by mount. 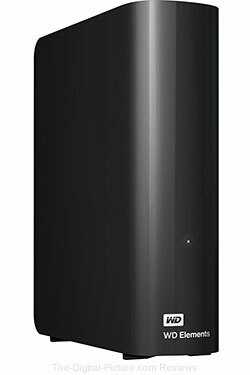 Though midnight tonight Eastern Time, B&H has the WD 6TB Elements Desktop USB 3.0 External Hard Drive available for $99.99 with free shipping. Regularly $159.99. 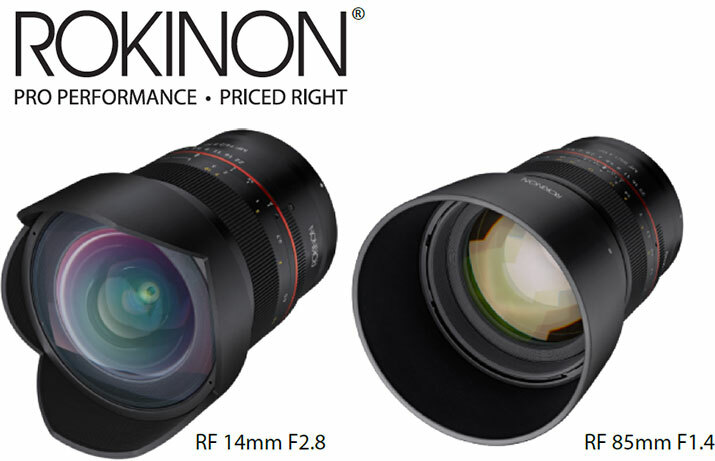 (New York, New York) March 26, 2019 – ROKINON is proud to announce its new 14mm F2.8 and 85mm F1.4 full frame lenses built for the Canon EOS R mirrorless system. This ultra wide-angle and fast telephoto are the first 14mm and 85mm prime lenses with precision manual focus control to be available in Canon RF mount. Both lenses sport a new exterior design with a contemporary look that matches and handles well with Canon’s new full frame mirrorless cameras. Each lens offers a metal chassis, weather sealing, a metal aperture control with a slip resistant matte finish, and Ultra Multi-Coating. The new ROKINON 14mm F2.8 Canon RF mount ultra wide-angle lens provides a dramatic rectilinear 115.7° view that can focus as close as 11inches and is perfect for astrophotography, landscapes, extreme sports, interiors, and real estate imagery. Its advanced 14 element-10 group design utilizes four highly specialized element types [High Refractive Index, Hybrid Aspherical, Aspherical and Extra-Low Dispersion] to produce sharply defined images with minimal distortion and chromatic aberrations. Features include a built-in petal shaped lens hood and a rear gelatin filter holder. The new ROKINON 85mm F/1.4 Canon RF mount telephoto lens offers a very fast F1.4 maximum aperture for effective low light shooting, fast shutter speed capture, and precise selective focus control. Its optical design consists of 9 elements in 7 groups including one Hybrid-Aspherical element to reduce chromatic aberrations for increased clarity and sharpness. Features include a removable lens hood, a curved blade diaphragm for pleasing bokeh, and a non-rotating 72mm filter mount for easy use of polarizing and other filters that require precise positioning. This ROKINON short telephoto for Canon RF mount makes it a highly effective optic for travel, candid, portrait, and close up photography. These first two ROKINON full frame lenses designed for Canon RF mount will be available in April from authorized ROKINON dealers. 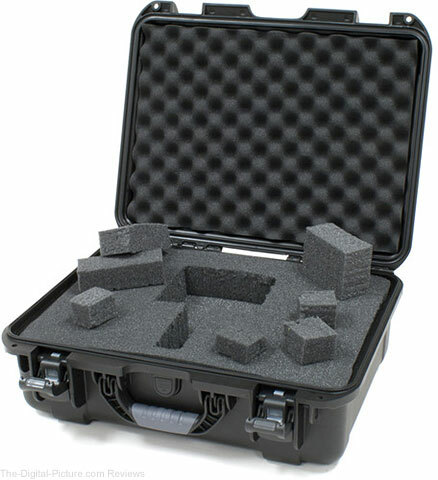 Through midnight tonight Eastern Time, B&H has the Nanuk 930 Case with Foam (Black) available for $99.95 with free shipping. Regularly $144.95. 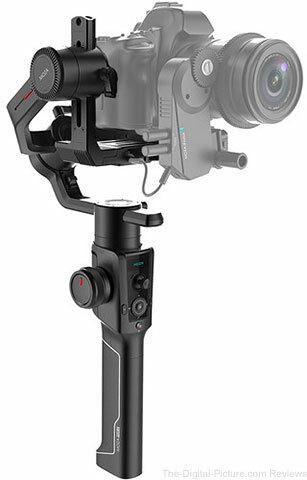 Through midnight tonight Eastern Time, B&H has the Moza Air 2 3-Axis Handheld Gimbal Stabilizer available for $499.00 with free shipping. Regularly $599.00. Just posted: Canon EF-M 32mm f/1.4 STM Lens Review. This is a remarkable little lens. Rent the Canon EF-M 32mm f/1.4 STM Lens from Lensrentals. As I mentioned in the review, this lens is worth getting an EOS M-series camera just to mount it on. Act fast to get a great deal on one of these cameras during the Canon USA Store Friends and Family Sale!